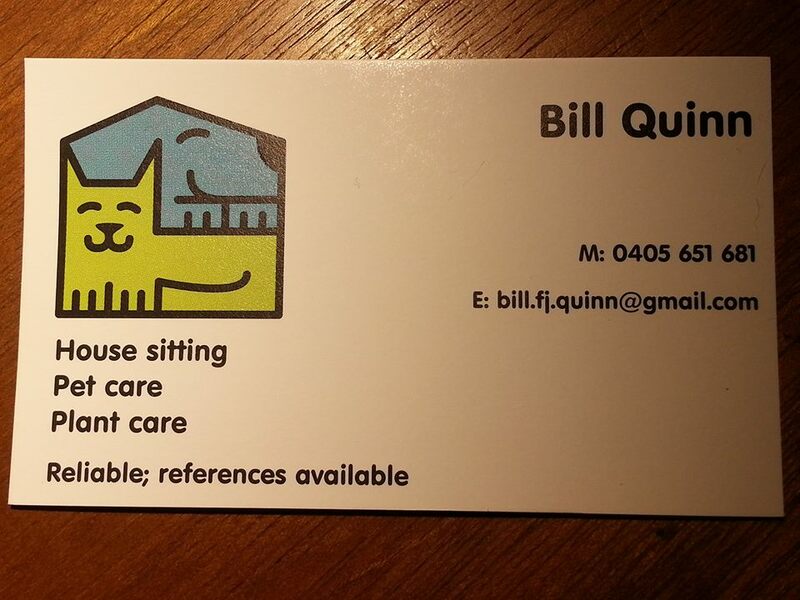 I’m a very experienced house-sitter available for short, medium and long-term house-sits in Sydney and surrounds, but am open to opportunities in NSW, ACT, Qld, Vic and pretty much anywhere. I’ve put all my references in one place here. Contact details for referees are available on request. If you’re after someone who can take good care of your pets as well as your house, flat, castle, bungalow, mansion, etc. please read on. I’m a responsible, mature bloke, fifty+ years young, with lots of experience. I’m great with cats, dogs, chooks, other birds, rats, fish, guinea pigs, rabbits, snakes, lizards, lawns, pot-plants and pet rocks. I have a fistful or three of references from happy client home-owners, and while I’m very lucky to be in demand for repeat house-sits, my calendar does occasionally have short to long gaps. I started house-sitting in Canberra in the early 2000s and have minded properties in Aranda, Bonner, Bruce, Downer, Flynn, Fraser, Hawker, Kingston, Latham, Canberra City, Braddon, Ngunnawal, Kambah, Palmerston, Rivett, Torrens, and Waramanga. I moved to Greater Sydney in 2013 and have house-sat in Peakhurst, Miranda, Annandale, Matraville, Bilgola Plateau, Naremburn, Dundas Valley, Wangi Wangi (Lake Macquarie), Point Clare (Central Coast), Corlette (Nelson Bay), Wattle Grove, Kingsgrove, Riverwood, Baulkham Hills, Lane Cove West, Ourimbah (Central Coast), Northmead, Holsworthy, Paddington, Yagoona, Hornsby Heights, Avalon, Queanbeyan, North St Marys, Cattai, Surry Hills, Thornleigh, Singleton, and as far south as Tuross Head. In Queensland, my housesits have been in Witta, Palmwoods, Eastern Heights, Ipswich, East Ipswich, Riverhills, Sunnybank Hills, Coorparoo, Indooroopilly, Coolangatta, New Farm, Burleigh Heads, Wavell Heights, Ascot, Oxenford, Upper Kedron, Capalaba, Wynnum, Wynnum West, Bracken Ridge, Kangaroo Point, Eaton Hills, Algester, Mt Ommaney, Tannum Sands, Machans Beach (Cairns), Barlows Hill (Yeppoon), Birkdale, Berrinba, Scarborough, and Rothwell. I’m in Sydney and surrounding regions for the forseeable future, but am open to suggestions. I’m not a big goer-outer. Maybe a trivia night here and there, and the odd lunch and dinner with social groups. I currently work (three-quarterly to fully retired) from a home location, so I can provide excellent companionship for your animals. If you have WiFi and will let me have access to it, that makes my life a little easier. You can be assured that I will take good care of your house and all in it. I have a full national police check done in January 2018. I also had a Queensland Blue Card (working with children) from 2015-2018, and a full Australian Government baseline/protected security clearance done in 2012 for federal employment. I have no pets, and my two adult children do not live/travel with me. I do NOT use Facebook Messenger, and will not necessarily see any messages that you send there. Best not to. Email is ALWAYS better. Please always provide a phone number. I have unlimited calls on my mobile plan and can call you locally, domestically or internationally. If calling me, please leave a voicemail if you can’t reach me.